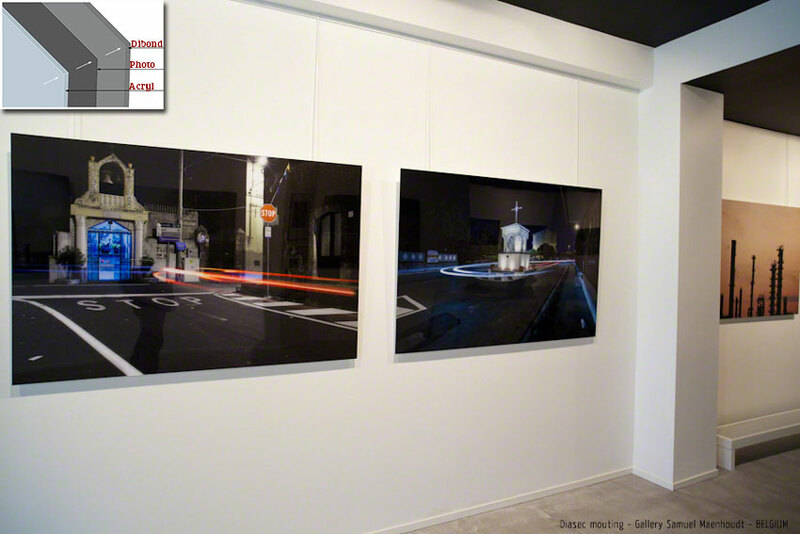 Artworks are available as Archival Pigment prints in limited or open editions and available in different sizes. To inquire about the price please fill up the contact form with the URL of the image you'd like to buy. Also known as "Giclée Prints", were originally developed in 1984 as a digital method of fine art printing. The word Giclée is French for “to spray on” or “to spray ink.” This advanced method of creating museum quality art prints uses high-end ink jet printers and archival papers and inks. The use of pigmented inks for the purpose of archival printing is ideal as they can have a storage life up to, and beyond, 200 years; when stored in a museum-quality frame under ideal conditions and lighting. Printed by the author, signed, numbered and certified directly by the author. Every print is delivered with an authenticity certificate. We have adopted the Hahnemuehle Certificate of Authenticity system. The Hahnemühle Certificate of Authenticity was designed to protect the security and genuineness of your limited edition artwork and to reduce the risk of forgery. 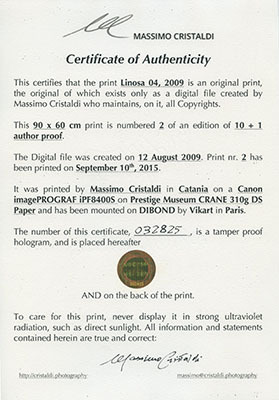 Each certificate is made of premium deckle edged mould made paper with a watermark and fluorescent security fibres. A serialized numbered is reported at bottom of the hologram. 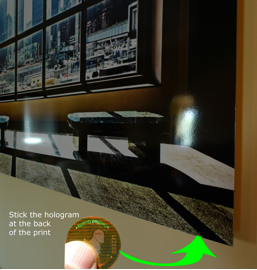 A second, identically numbered hologram should then be applied to the reverse side of the artwork. The combination of certificate and hologram assures that each Certificate of Authenticity relates to one particular print. Artworks can be mounted on Dibond, or DIASEC upon request. Unmounted artworks are shipped rolled. Mounted artworks are shipped boxed in wooden boxes. All shipping includes insurance. Can be mounted upon request. 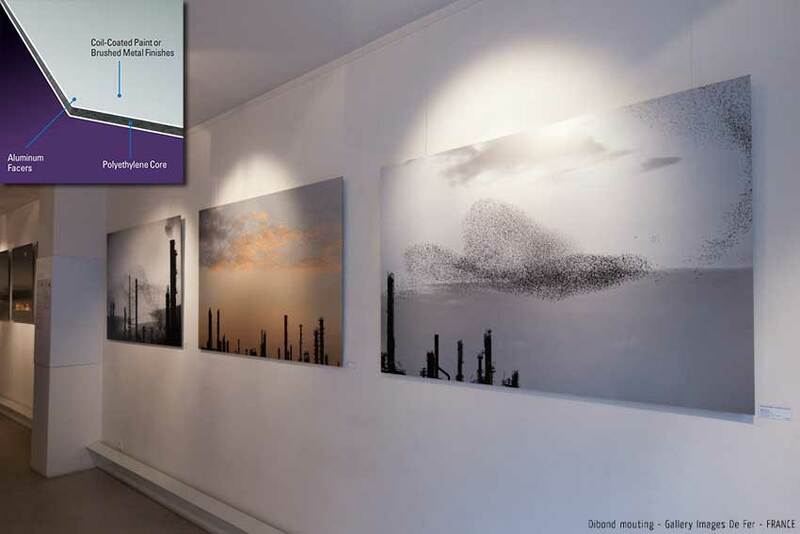 Our prints can be directly mounted on DIBOND, a surface made of a sandwich of Aluminium, Polyethylene and Brushed metal finishes. For a better protection the prints are normally laminated with a matte coating to preserve color redention and avoid unwanted light reflexes. Diasec is a patented process used for facemounting prints like photographs on acrylic glass. The process was invented by Heinz Sovilla-Brulhart in 1969. Because of the different light penetration and refraction of acrylic glass compared to normal glass, the colours are more brilliant and the image sharper than compared to standard glass in a picture frame. A Diasec mount is usually of a high gloss finish. Because the print is glued to the acrylic glass, the result is a completely flat mount of the image. The print is also resistant to ultraviolet (UV) light because of the properties of acrylic glass. There are other processes to achieve similar results, these are in the photographic or art world sometimes also called Diasec prints. Diasec is however a registered trademark. For the reverse side, we use 3mm dibond. More on DIASEC can be found here.